If you would like to support our work, there are several ways to get involved. Donate. Help us to reach more women with the tools to build a sustainable and meaningful life for themselves and for their families. Share Your Story. Have you faced a challenging issue and have advice or inspiration to share with others? We’d love to consider your story for the site. Talk to us here. Share Your Expertise. Is there a topic you thing we should cover on the site? Have suggestions? Visit here. Become a Sponsor. Does your company or nonprofit have expert information that could benefit our readers? Contact us for more information about requirements for sponsored content. Promote Women Deserve Better. Help us connect others to holistic, woman-centered resources and support. 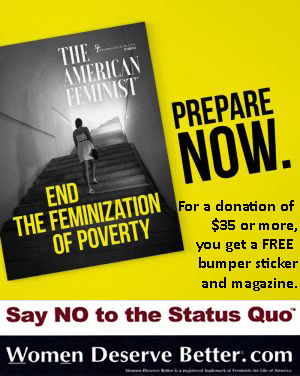 Shop at Women Deserve Better for brochures and bumper stickers to help promote this resource.